A few months ago, Brenda Ratliff owner of Pink Castle Fabrics and brand new fabric designer for RJR fabrics contacted me and asked me if I’d like to make something with her debut fabric collection, Pie Making Day. When I saw the prints and colors I jumped at the chance. I think they’re so fun! This collection is definitely vintage-inspired but with some colors and geometric prints that would work well into modern quilts as well. Here’s a view of the range of prints in each color. I’m especially smitten with that dark pink and the dark teal. Nice saturated tones in colors I’m low on. Lots of great blenders in this collection as well. With a big deadline crossed off my list yesterday, last night I couldn’t wait any longer and started cutting into that stack. I pulled out my AccuQuilt GO cutter (I used the 4″ finished HST square die) and made quick work of a stack of half-square triangle blocks (same size I used for my Spectrum quilt). I got the whole thing cut out last night while watching So You Think You Can Dance with my girls. Now I just need time to sew it all together. I got a few HST’s chained through last night and already LOVE how it’s coming together. 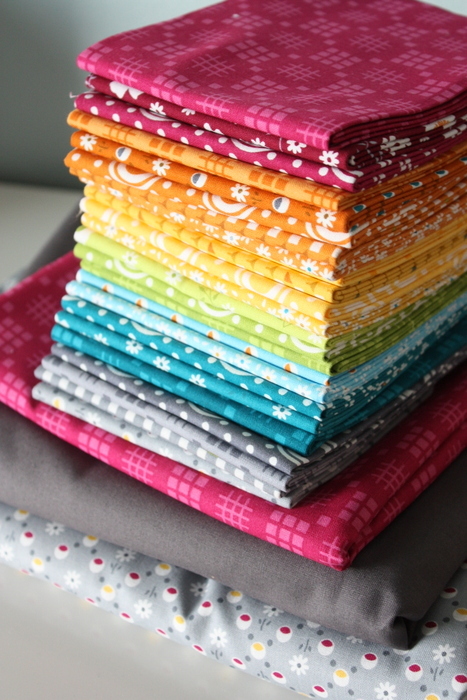 Pie Making Day is available for pre-order from Pink Castle Fabrics and will be widely available in stores this summer. Hahaha….saw that first photo and thought this was right up your color alley! :) I love every one of them…noooooo….must resisit!! Those are gorgeous fabrics! I can’t wait to see what you are making. What terrific colors and prints! Looks so fun and cheerful, good for you! 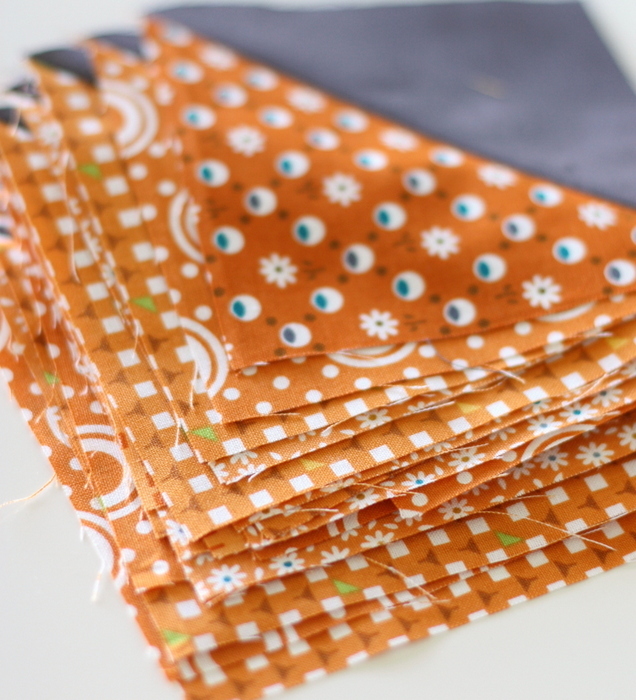 These fabrics are gorgeous, and you made my day when I sew you’d put them with a grey! I’ll have to hunt these out in the UK. Can’t wait to see the finished quilt! They look like candy!! Loooove the color combinations. Can’t wait to see a finished top! Beautiful lush colors. My favorites. I love those colors, and I can’t wait to see the finished quilt. The gray fabric will be the perfect match for the vibrant hues. Those fabrics sang to me the first day you posted them. I’ll be looking forward to seeing your creation! This is a great line and I look forward to seeing what you do with it. I especially love the circles (pie tins?) and the tone-on-tone squares (lattice?) So nice! It was hard to unbundle them, that’s for sure. My only problem is deciding whether to get the FQ bundle or the half-ard bundle. LOVE those pretty fabrics! Can’t wait to see what you’re up to with all of those HSTs! Tecidos lindos, cores vibrantes e alegres. Fico imaginando uma linda e aconchegante colcha. OH my gosh. That’s for sure a collection I will need to have. I love everything about those fabrics; the colors and design. Beautiful. I love the fabric! The colors are wonderful. Just when will we get a chance to buy some of those gorgeous fabrics? Oh, these are gorgeous! I hadn’t seen these prints yet, but I’m off to find them now.